This was one of my favorites as a child and as I read it out loud to my own kiddo this week, I remembered why. The Borrowers is simply magical and a tale every kid can get enchanted by. The pages I read from were wrinkled with love, where I had toted it to school, to the mountain for camping, and every other place. I read it over and over again, and I’m hoping that my own kiddo will find the joy of reading this herself as she gets older. But for now, I’m happy to read it aloud, and even happier to discover what other adventures are in store for Pod, Homily, and Arriety – as we’re about to begin reading The Borrowers Afield, which I never knew existed until I worked in a bookstore as an adult. I read this aloud to my five year old today. Not all in one sitting, but all in one day. It was quite the affair, filled with many tea, coffee, sandwich, and taco breaks. My voice is tired, but both our minds – despite the late hour – are alive with visions of dandelions as large as ourselves, bees to be pet like cats, and cats as large as an elephant. I long to be Spiller, dashing around a field, “borrowing” from gypsies, sailing downstream in a soap tin. I adored The Borrowers as a child, and just discovered its sequels recently; and despite having read The Borrowers Afield for the first time as an adult today, I think I might like it more. I’m enchanted, and have enjoyed all my daughter’s renderings of tiny houses with oversized flowers and butterflies, on her drawing pad today, while I read on and on. We look forward to the next book, The Borrowers Afloat. The Borrowers Afloat took off just after Afield and left the Clock family living in less than desirable quarters along with the Hendrearys. It took far to long for them to actually make it down the drain the pipe and back into the out of doors, and this book along with the one after it – The Borrowers Aloft – were my least favorite. Mostly because the dangers became more and more stressful and the lives of the Clocks simultaneously more convenient but less cozy. I did very much enjoy the introduction of Miss Menzies, and so did the kiddo. We delighted in her as much as Arrietty. I still adore the entire series and these books deserve every star available to them. Finally the story of the Clocks is all wrapped up. But is it?! We lamented the ending and long to know what became of Arrietty’s whole life. Did she marry Spiller as she speculated? Or did Peagreen capture her heart as he did her mind? Now we are off into another series of books for more adventures of a different nature. Kiddo and I started the year reading The Confessions over breakfast… we got caught up in The Magic Tree House Adventures and that got put on the back burner, but I intend on putting a good dent in this list this year, so we need to get back on it. Feel free to join me. As some of you may know, I am a sucker for the classics. I’m also a sucker for lists. In addition to that, I plan to homeschool my daughter. What better books for me then are those of Susan Wise Bauer? I am a college graduate who has had the pleasure of working for a bookstore for some years now and doesn’t want my “education” to end with a Bachelor’s degree in Business. I want to go through Bauer’s list while I pay off my student loans before going back to school. Bauers covers five genres worth of lists of books that people need to read to be fully and classically educated. Many of these a lot of us have already read, and many of these we’ve always heard referenced and talked about reading but have never actually done it. Lately, in the blog world, I’ve been coming across a Classics Challenge, and was reminded of the fact that there may be others out there who would like access to this list and discussions where other people are reading these books. 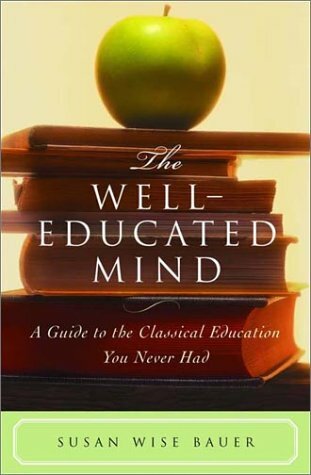 I am also the admin of a Shelfari Discussion Group called Classical Re-Education and I post reviews and commentary on my reading in that group, links for each book discussion are provided. Of course, I also share my reviews here on my blog. As you can see, I just recently finished Kafka’s The Trial and will soon be starting The Native Son. I’d love for others to join me. Have you read any of these lately? Which were your favorites? What would you add to the list if your goal was to walk people through the History of the Novel, as Bauer’s has done? P.S. Susan Wise Bauer will be lecturing at the Texas Home School Coalition Southwest Convention The Woodlands, Texas, Thursday-Saturday August 2-4. I don’t remember learning to read, as I did it from such a young age. I do, however, remember the first books I fell in love with and the first books I read that were difficult for my limited vocabulary. Laura Ingalls Wilder I fell in love with first, I read the entire series several times by the end of first grade. Little Women, however, I fell in love with and learned from in second grade. 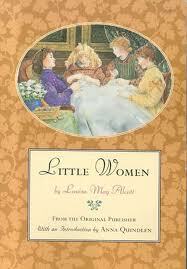 Little Women taught me new words and phrases, culture, and how I wanted to live. Josephine March has been one of my heroes since I was seven and first read about her chopping off all her luxurious hair. As a young girl, I identified quite well with her “one beauty” (that amazing hair) and tomboyish ways. I myself, was a ruddy, freckled girl, often found either playing tag football with boys at recess or perched in an oak tree reading a book, hair flowing every which way that my mother did not allow me to cut. My first significant hair cut, I donated two feet to locks of love, and who else was on my mind? Jo March. I re-read the book multiple times before I left elementary school, getting more and more out of it each time as my reading skills improved. And despite cherishing it always, I set the book aside and did not read it again until my twenty-seventh year, this year, to my one year old daughter. Like every good American, I am wholly addicted to that black magical brew, it’s in our veins and culture, look at how well Starbucks has taken off. But my family did not keep coffee readily available, my dad won’t touch the stuff and my mom’s mother died of cancer the doctors blamed on her caffeine intake so she never kept it around growing up. So part of me wonders if Alcott played a role in my introduction to it, as I don’t remember a time when I did not love it. I remember sneaking cups of it from the employee break room at the bus barn where I waited with my bus driver between routes in elementary school. In hindsight, I believe it was the reverence that writers hold for it, the way it is talked about in books, that drove me to love it so much, and it very well may have begun with Little Women. Then, there is Theodore Laurence. I believe every guy friend’s worth that I ever had my whole life was measured against the character of Laurie. He is whimsical, gallant, a rascal and a gentleman. Theodore Laurence is handsome, a friend, and all around a good time. Every girl needs a Teddy-Dear in her adolescent life and if you can’t get one in the real world, its time for yet another read of Little Women so you can live vicariously through Jo! Jo March taught me to love, to read, to pursue life with a fiery passion, and how to pick my friends. It was Jo March that sparked the first desires in me to be a writer. It was Little Women, and the romance of Jo and the Professor, that set the stage for me to fall in love with the art of Jane Austen and the Brontes. It was the pen of Louisa May Alcott that taught me how to really enjoy books and the thrilling life they have to offer.